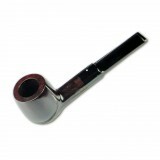 Alfred Dunhill makes the finest quality briar pipes in a wide variety of shapes and finishes. 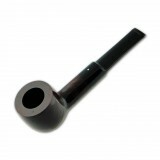 Sandblasted finishes include the classic black Shell Briar finish, as well as Cumberland, County, and Rubybark. Smooth finishes include the lightest and highest grade Root Briar, slightly darker Amber Root, as well as Chestnut, and Bruyere. Some White Spot pipes receive Sterling Silver or Gold bands, while others have bamboo or horn shank extensions. All mouthpieces are hand cut from the highest grade Vulcanite or Cumberland rods, and occasionally natural horn. Abu Simbel Pipe No. 27 / 200 - In Stock No. 140 / 200 - In Stock T..
White Spot Amber Flame Straight Grain Pipe 1 Alfred Dunhill's White Spot pipes are a product ..
White Spot Amber Root Pipe Group 2 (2108) Alfred Dunhill's White Spot pipes are a product of..
White Spot Amber Root Pipe Group 3 (3102) Alfred Dunhill's White Spot pipes are a product of ..
White Spot Amber Root Pipe Group 3 (3602) Alfred Dunhill's White Spot pipes are a product of ..
White Spot Amber Root Pipe Group 4 (4102) Alfred Dunhill's White Spot pipes are a product of ..
White Spot Amber Root Pipe Group 4 (4114) Alfred Dunhill's White Spot pipes are a product of ..
White Spot Amber Root Pipe Group 5 (5406) Alfred Dunhill's White Spot pipes are a product of..
White Spot Bruyere Pipe Group 2 (2205) Alfred Dunhill's White Spot pipes are a product of nat..
White Spot Bruyere Pipe Group 2 (2406) Alfred Dunhill's White Spot pipes are a product of nat..
White Spot Bruyere Pipe Group 2 (2421) Alfred Dunhill's White Spot pipes are a product of nat..
White Spot Bruyere Pipe Group 3 (3112) Alfred Dunhill's White Spot pipes are a product of nat..
White Spot Bruyere Pipe Group 3 (3407) Alfred Dunhill's White Spot pipes are a product of nat..
White Spot Bruyere Pipe Group 4 (4103) Alfred Dunhill's White Spot pipes are a product of nat..
White Spot Bruyere Pipe Group 4 (4106) Alfred Dunhill's White Spot pipes are a product of nat..
White Spot Bruyere Pipe Group 4 (4114) Alfred Dunhill's White Spot pipes are a product of na..
White Spot Bruyere Pipe Group 4 (4117) Alfred Dunhill's White Spot pipes are a product of nat..
White Spot Bruyere Pipe Group 4 (4203) Alfred Dunhill's White Spot pipes are a product of nat..
White Spot Bruyere Pipe Group 4 (4206) Alfred Dunhill's White Spot pipes are a product of nat..